Heat your grill on its medium setting or prepare charcoals for grilling. Spray the Vidalia onion slices on both sides with cooking oil spray (alternatively, they can be brushed with olive oil). Place on the grill and cook for 4-6 minutes per side, until browned and softened. Remove from grill. Once you flip the Vidalia onions, spray the pepper slices and eggplant slices with cooking oil and add to the grill as well. Cook for 3-4 minutes per side until softened. The peppers will soften some, but remain firm overall. Once all the vegetables have been cooked, spray both sides of the tortillas with cooking oil spray. Place on the grill and cook for 3-4 minutes per side until browned and puffed slightly. Remove from the grill. Tortillas will crisp upon standing. Prepare the tostadas: Place one tortilla on each of four plates. Divide the refried beans evenly among the tortillas. Top with the prepared veggies. Sprinkle with cheese and salsa, as desired. Serve. My grill and I are like this because we spend a lot of time experimenting together. Can you cook breakfast on a grill? (Yes.) Dessert? (Yes.) My latest experiment involved seeing if I could turn a tortilla into a tostada shell merely by spraying it with cooking oil and grilling it. (YES!) I love when these experiments work out. 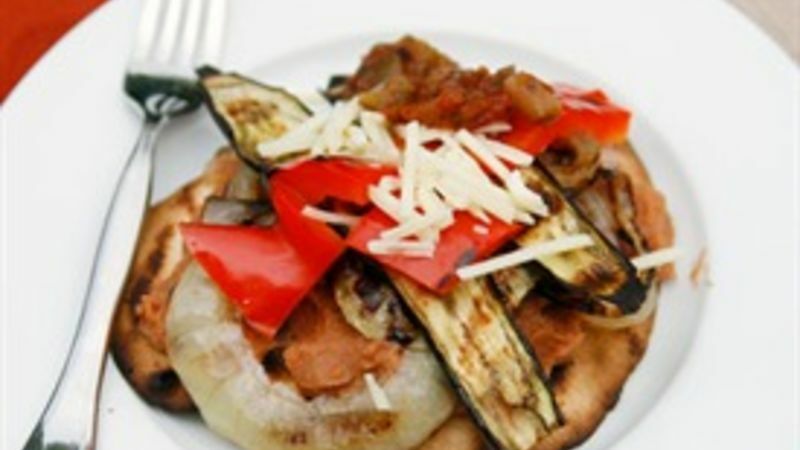 Grilled Veggie Tostadas are easy to make. You grill up veggies until they are sweet and a just a little charred, giving them that great smoky flavor that you can only get from grilling. Then comes the fun part. You grill the tortillas until they are browned and puffy. Magically when you let them cool down, they harden into crispy, delicious shells. It’s awesome. Once that’s all done, you pile the tortillas high with refried beans, grilled veggies, cheese and salsa. These babies might look small at first, but they are pretty filling. However, if you have big eaters, you might want to make a double batch to ensure that there’s enough for everyone. Or serve these with a giant chopped salad. These are perfect for a lunch or a light dinner.